A major breakthrough in the treatment of Alzheimer's disease is revealed today (July 29) by scientists at the Alzheimer's Association International Conference on Alzheimer's Disease (ICAD 2008) in Chicago, Illinois. A major breakthrough in the treatment of Alzheimer's disease is revealed today (July 29) by scientists at the Alzheimer's Association International Conference on Alzheimer's Disease (ICAD 2008) in Chicago, Illinois. Their pioneering research points to a new treatment that appears to slow the progress of the disorder by 81% over a year, and could offer hope to millions worldwide. The product - remberTM - is the first drug to act on the tangles discovered by Alois Alzheimer over a century ago. The team at the University of Aberdeen (UK), working with TauRx Therapeutics - a Singapore-based company spun out of the University - developed a novel treatment based on an entirely new approach which targets the tangles, aggregates of abnormal fibres of tau protein forming inside nerve cells in the brain. These aggregates first destroy nerve cells critical for memory and then destroy neurons in other parts of the brain as the disease progresses. Patients receiving the study treatment experienced an 81% reduction in cognitive decline over one year, and did not experience a significant decline in their mental function over 19 months. The TauRx brain imaging data also showed that the drug had its biggest effect in the memory critical parts of the brain where the tangle density is highest. Professor Claude Wischik, Chairman of TauRx Therapeutics and Professor of Psychiatric Geratology and Old Age Psychiatry at the University of Aberdeen's Institute of Medical Sciences, who led the research, said: "This is an unprecedented result in the treatment of Alzheimer's disease. We have demonstrated for the first time that it may possible to arrest the progression of this disease by targeting the tangles which are highly correlated with the disease." "This is the most significant development in the treatment of the tangles since Alois Alzheimer discovered them in 1907." Alzheimer's disease is a degenerative and terminal brain disorder which affects millions of people around the world and a major and growing burden on health services in all countries with an ageing population. During the course of its progress there is a build up in the brain of lesions called plaques and tangles. Following these results from the largest Phase 2 clinical trial of a disease modifying treatment conducted to date, TauRx is now planning a Phase 3 trial which should begin next year. If the Phase 3 trial confirms the Phase 2 findings, the drug could be available by 2012. "With the world population ageing globally and the enormous burden on health services and economies worldwide, we urgently need to confirm our findings in a larger trial with a view to making this treatment available as soon as possible," commented Professor Wischik. "World Health Organisation (WHO) figures indicate that there will be more than one billion people aged 65 and over by 2050, of whom we calculate about half will have tau tangles in their brains. This makes it particularly important to develop new treatments to halt and prevent tangles forming in the brain." Professor Wischik and his team have spent 24 years investigating the structure and role of the tangles in the development of the disease. This builds on their discovery 20 years ago that the tangles are made up of a protein called tau and later that its aggregation or clumping is highly correlated with the progression of Alzheimer's. They found that plaque development, which has been the main focus of research so far, is more a feature of normal ageing and is poorly correlated with dementia. The team then looked for a drug with the ability to dissolve the tau protein fibres of the tangle and developed remberTM - a novel form of a chemical with a long history of use in the treatment of other conditions. They found that the drug works in a range of laboratory test systems which they pioneered. TauRx has patented the medical use of remberTM for the treatment and prevention of Alzheimer's. TauRx tested the drug in the Phase 2 clinical trial involving 321 patients with mild and moderate Alzheimer's disease in the UK and Singapore. The decline seen in patients treated with remberTM was not significantly different from their starting score to the assessment at one year and at their final assessment at 19 months. In addition to cognitive testing, patients had repeat brain scans at the start of the study and after 25 weeks. These showed that the treatment effect was greatest in the memory-critical brain regions where the density of Alzheimer tangles is greatest. In the control group, there was a significant decline from the starting score in cognitive testing and on brain scans. There were statistically significant differences between the patients receiving the study drug remberTM and the controls at 24 and 50 weeks. Revealing the University of Aberdeen and TauRx's findings to the the 2008 Alzheimer's Association International Conference on Alzheimer's Disease (ICAD 2008) in Chicago, United States, Professor Wischik added, "I am delighted with these results. This is the first trial of an Alzheimer's disease modifying drug which actually hit its primary pre-specified efficacy target." Professor Stephen Logan, Senior Vice Principal of the University and TauRx board member, added: "This is a fantastic breakthrough and is an example of an important collaboration between our spinout company TauRx and the University of Aberdeen. There is no doubt that this close relationship has been crucial in providing an ideal platform for a major medical advance. The University of Aberdeen is extremely well placed to lead this research due to our first class imaging facilities, in partnership with NHS Grampian, and our expertise in medicinal chemistry and medical sciences. 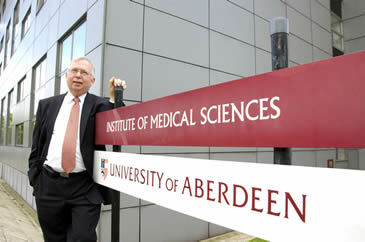 This is further evidence for Aberdeen's growing reputation as a centre of excellence in life sciences." TauRx Therapeutics was established in Singapore in 2002 with the aim of developing new treatments and diagnostics for a range of neurodegenerative diseases based on its technology platform which it is also reporting for the first time at ICAD 2008. As well as Aberdeen, it has operations in Warsaw, Berlin, France and China. Professor Wischik commented: "This result now validates our pipeline capability for development of second and third generation disease modifying treatments in this space." In addition to the imminent Phase 3 trial in Alzheimer's, TauRx is planning a trial in Parkinson's as remberTM also has activity on the synuclein fibres which accumulate in the brains of these patients. TauRx is also developing substances which it hopes to test in brain scans to measure the build up of tangles so they can be diagnosed early and treatment can be started before they cause permanent damage. Tel: +44 (0)1224 272014 or email href="mailto:s.kirby@abdn.ac.uk">s.kirby@abdn.ac.uk</a>Â for further information.